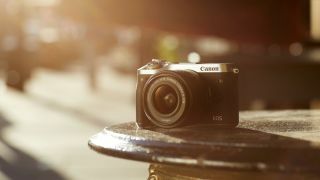 Along with the new EOS Rebel EOS T7i / EOS 800D and EOS 77D DSLRs, Canon has unveiled a new addition to its family of mirrorless cameras – the EOS M6. The M6 features a 24.2MP APS-C CMOS sensor, although it's not the same chip as found in the new DSLRs. It's also equipped with the new DIGIC 7 image processor that'll see the EOS M6 shoot at up to 7fps, or an even faster 9fps with fixed autofocus. There's also in-body 5-axis video stabilisation, although one slight disappointment is that the EOS M6 only shoots in Full HD, albeit at 60p; it would have been nice if you could capture 4K footage too. Canon's Dual Pixel CMOS AF is also on board – we've been impressed by this system in Canon's EOS M5, so it should deliver the goods in terms of fast and accurate autofocus performance here. There's a 3.0-inch tilt-angle touchscreen that now flips up for selfies and vlogs. For controls we have a thumb operated dial, while there's integrated Wi-Fi and NFC connectivity. Additionally, a constant connection between the EOS M6 and your smartphone or tablet can be maintained via a low-energy Bluetooth connection – this enables you to view your photos without taking your camera out of its bag, and use your smart device to remotely trigger the shutter. Sold separately, Canon has also announced a new EVF-DC2 electronic viewfinder. Compatible with the EOS M6 and other mirrorless models, as well as some PowerShot compact cameras, the new 0.39-type EVF-DC2 features a 2.36 million dot display and a refresh rate up to 120 fps. It can't be angled like the EVF-DC1, but it only weighs 29g. The EOS M6 with EF-M 15-45mm f/3.5-6.3 IS STM lens will be available from April 2017, priced at $899.99 / £839.99 – Australia pricing to be confirmed. The EVF-DC2 will be available at the same time, priced at £219.99 – US and Australia pricing tbc.